aided by Carl, Dean and Elwood, his sons. Rochester valley north of town, if not Vermont. according to Dean, by the Northfield Bank. because what George mostly had was his word that he stood behind. made it up to the land to have a look. “put in” another access road. We agreed in principle and signed a paper so stating. the roads, planning each lot around the characteristics of the terrain. person would not want to “let it all go” at one time. on credit of course, just like George. Brought the land, George was letting the pastures grow up to young maples. because of good things which were being said of us. difficulties presented by the hill-site itself. who hadn’t been privy to the original agreement. George had died. And besides, there was a contract in evidence. new Colony would positively impact the Town. be profitable for the Rochester Electric company. was and the manner in which we planned to achieve our goals. squarely behind us, a circumstance which has not changed to this day. Tarbet Sector to the original sector bought from George and the Martin sons. finally purchased the camp land. opponents in trade, commanding my highest regard. but not without its own unique drama. Thoreau would have smiled on. up out of the road because the road went through. 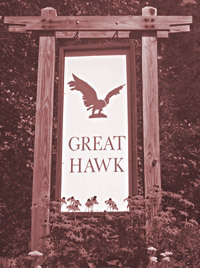 unified the area into the one-of-a-kind Great Hawk Colony.